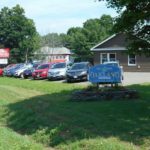 Powers Auto is proud to have a Sales Annex located at 17 Old Waterville Rd, Oakland, Maine. Across the street from Dollar General , Lower KMD Oakland. Powers Auto Oakland Annex hours are Monday through Friday from 8:30 a.m. – 5:30 p.m. and Saturdays from 9:00 a.m. – 3:00 p.m.. Our telephone number there is 207-716-1564.